The documentary Fresh Dressed, directed by Sacha Jenkins, educates on the origins and inspirations of hip hop fashion and builds a convincing case for the art and culture of Hip Hop. The documentary was the debut project of Jenkins and featured hip hop and fashion icons such as Pharrell, Kanye West and Andre Leon Talley. 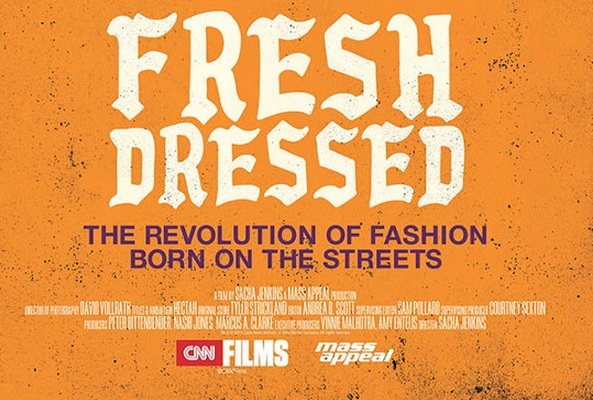 The chronological storytelling of the documentary shows the growth of urban fashion and explains the mental reasoning behind why “being fresh” is so important in the African American community. When slavery was rampant in the United States, African Americans were subjected to deplorable living conditions and often had nothing other than thin scraps of clothing to dress themselves with. However, it was customary for masters of plantations to provide one piece of clothing per slave that was in good enough condition to be used for church. After slavery was abolished and blacks were free, the tradition of dressing in your best on Sunday remained. To African Americans, clothing is an expression of where they wished to be in life, financially and socially. In the 80’s and 90’s as poverty was common and unfair treatment of minorities was the norm, black celebrities and fashion icons began to reclaim high-end fashion brands such as Tommy Hilfiger and Louis Vuitton as a challenge to the establishment. It was a show of wealth and power during a time where not much else could be done or said to express black rage and unhappiness. This is relevant today because people in the African American community and black superstars of today are often called out on spending extravagantly on clothes, shoes, jewelry (“bling’) and other superficial items to show wealth. The fact that African Americans will spend their money on expensive sneakers or a high-end belts before paying a bill or taking care of other financial responsibilities can be seen as careless and un-intelligent. Fresh Dressed is a much needed educational documentary. It creates a sense of pride in African American culture that is not often recognized or discussed and also exposes the strengths and weaknesses in our modern day culture. “The documentary…was refreshingly unique…It showed me how imperative it is to support brands made by African Americans in order to break barriers into mainstream fashion,” said Simone Hardeman, a Junior Masters of Business Administration major from Raleigh, NC. Colorful and intriguing, the documentary makes Hip Hop culture a topic that should be taken seriously which helps to give the hard work and ingenuity of the African American people the credit that it has been long due.